When it comes to the things that can make or break an event, few things are important to consider—quality, flavor and service of food and beverages you serve. Finding the perfect caterer for your function is an essential element in your event planning process. Selecting particular caterer is not that easy. You need to go through various decision making process before hiring the one. Unfortunately, there is no standardized grading system for caterers and anybody can start their own catering business. A knowledgeable and experience caterer can make your life a lot easier, so it requires bit time to find best catering company on which you can rely and trust completely. It is not just the food and beverages that the caterer will make impression through. Items like linens, glassware, silverware and other catering equipment are all aspects require consideration while choosing your caterer. Before you start looking for caterer, define your budget. The caterer you choose is also a significant budgetary decision and can influence how much money you have left over to spend on other areas depending on food costs and quantities. Add in the fact that caterers can vary dramatically in their pricing and the types of meals and services they offer. We have a saying, “you get what you pay for”; so taking the cheapest option may not give the best result. Good caterers will provide an itemized quotation which includes everything you need to ensure smooth running of event. Listen to word of mouth recommendations. No amount of advertising can replace a good recommendation from somebody you know and trust. Check with the management at your events venue, and ask them to recommend caterers they have worked earlier. Schedule a tasting. Caterers who provide food for large events should offer to provide you with a tasting in order to gain your business for a large contract. Not every caterer is perfect for every type of event. Caterers vary not only in price but in services and options they offer. Good food should be matched with good service. Make sure the caterer you choose has the staff required to fully service your event. The amount of staff you need will depend on the size and nature of your event, so discuss your plans with the head of catering to ensure that your needs can be met. How responsive and interested a caterer is during your initial conversation. How flexible is your caterer in providing individual requirements? Have they made an effort to understand the needs of your guests? Can a menu be tailored to your tastes and budget? If you will be having children at your event or for special diets, ask if the caterer has allowances for these specific requirements. Who is behind the food? Surprisingly, how long a catering company is in the business is not as critical as who is behind the food. The chef’s background and experience can be more important than the owner of the company. The skills, experiences and passions of the chefs behind the scenes will ultimately be reflected on the plate. Fresh is always best and they are charging you as though it were made fresh. Insist on only using a caterer that uses fresh food, not frozen. Be sure to check if your caterer holds current insurance, health department and liquor licensing accreditations. 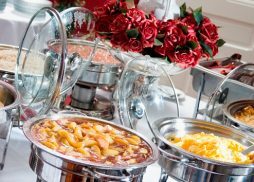 These are essential requirements for a catering business and without them your event may end up costing a lot more than your anticipation. With the adequate knowledge for the above factors and proper planning, finding the best caterer for your event does not need to be an ordeal. Remember success of the event depends on your choice of vendors, and the caterer you hire will be representing you at the event. So take your time, and choose carefully.